Home » ConnectLED for Android. Are you up-to-date? » News » ConnectLED for Android. Are you up-to-date? 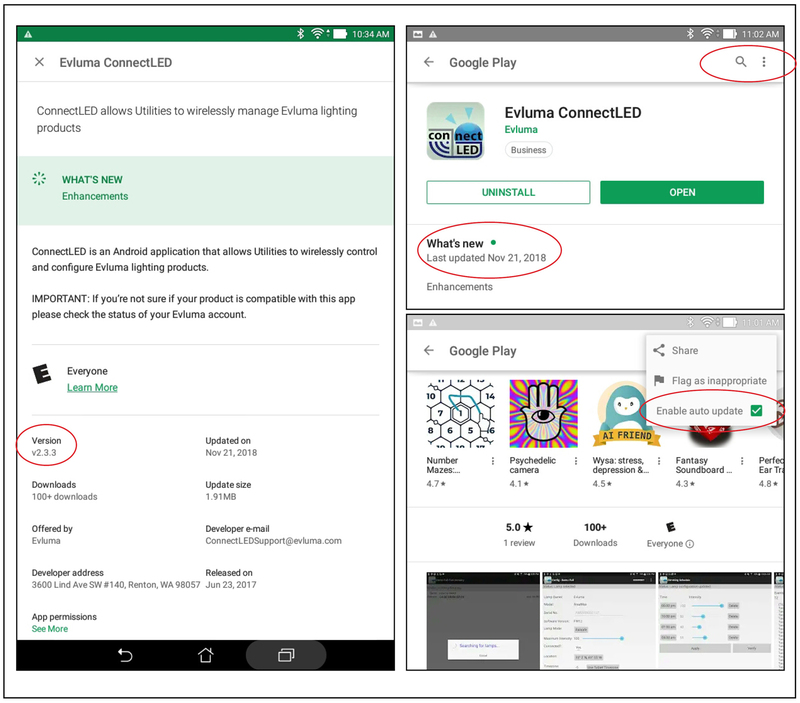 ConnectLED for Android. Are you up-to-date? How to check what version of ConnectLED (Android) you are currently running. 1. Start ConnectLED and sign in if necessary. An internet connection may be required to authenticate your logon if it has been a while since you ran the app. 2. Tap the three dots in the upper right-hand corner. 3. Choose SYSTEM INFO from the menu. Version information will be listed under App Info. 4. Open the Google Play Store. 6. Tap on Evluma ConnectLED to open. The date for the last update will be listed under What’s New. Scroll down until you see a row of screen shots and the link Read More below. Click Read More. The current version is indicated just under the E for Everyone rating. Click image to view large. 7. Does this version number match what your app indicates? You are good to go! It doesn’t? Check to see if updates are automatically being pushed to your device. If version number doesn’t match, play store screen will show an “Update” button instead of “OPEN.” Tap “Update” to update the app manually. How to Enable Auto Update. The process for enabling auto updates may vary depend on the device you are using. The instructions below are for the Asus P01Z. 1. 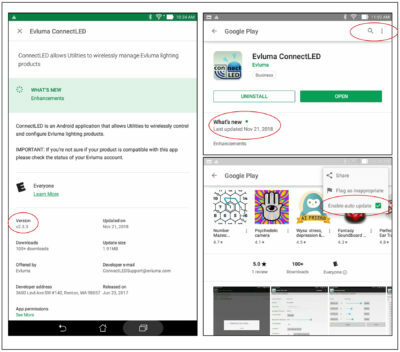 Find the ConnectLED app in the Google Play Store. 2. Tap the three dots in the upper right-hand corner. If Enable Auto Update has a green check mark next to it, you are receiving automatic updates. If the box is empty, touch the box to enable. You need to be connected to Wi-Fi to receive automatic updates. If it has been a while since you’ve updated your Android device please allow a few minutes for updates prior to operating. You can learn more about ConnectLED here. If you are a Company IT Admin you can always refer to the ConnectLED Admin Portal Guide found on this page under Reference Guide.